Please join us for the opening of Water Music, a group exhibition featuring top San Francisco Bay Area artists with works of art in various media inspired by the element and mystery of water: the sensual and emotional attraction we have to water; visual representations informed by leitmotifs from classic antiquity to contemporary abstractions; and works of art incorporating scientific inquiries into an element essential to life itself. Victoria Mara Heilweil and Phil Spitler are this exhibition's local makers, presenting Luminous Waveforms, illuminated seating made up of parametrically designed, sculpted wooden benches. San Francisco's RAWdance will perform throughout the evening, ending the company's six-month residency at DZINE. Exhibiting artists in Water Music include: Sue Cretarolo, Diane DallasKidd, Paule Dubois Dupuis, Austin Forbord, Laura Hapka, Victoria Mara Heilweil, Howard Hersh, Gina Jacupke, Sasinun Kladpetch, Yoko Kubrick, Katy Kuhn, Heidi McDowell, Adia Millett, Lian Ng, Jenny Phillips, Carrie Ann Plank, Silvia Poloto, Lucky Rapp, Georgina Reskala, Christopher Stark and Nikki Vismara. I am thrilled to be included in several shows across the country this month. In San Francisco, you can see a collection of my Cuba Mirror Paintings at The Drawing Room through March 31st, as well as my mixed media work at X Materia at DZINE Gallery through April 26th. I have work in nationally juried exhibition “Divergent Evolution” at Studio Montclair in Montclair, New Jersey. Three paintings from my Voicemail Series are in the Chicago area at The Art Center Highland Park in Beyond the Selfie. And next month, I will be sending one painting to Key West, Florida for a juried small works show. Scroll down to see descriptions of each exhibit. The exhibit, featuring artwork by diverse artists throughout the United States, includes one or more artworks from each artist that demonstrate the evolution of their creative process. There will be 44 pieces of work in a variety of visual media including sculpture, installations, photography, printmaking, painting, drawing, and mixed media. I am beyond excited to be participating in my first Art Fair thanks to Barba Contemporary Art. Art Palm Springs takes place at the Palm Springs Convention Center, Thursday Friday 14th through Sunday February 18th. Barba Contemporary will have my work on display at Booth 219. I am very humbled to be included in this exhibition juried by Staci Steinberger, Associate Curator of Decorative Art and Design at The Los Angeles County Museum of Art (LACMA) opening February 2nd at The Orange County Center for Contemporary Art. This acrylic & resin artwork is about time, grief, memory, and loss; it’s part of a larger series created 10 years after the death of a close friend. It is incredibly meaningful, slightly emotional but also very exciting this work was accepted. Please join me for the Holiday Gift Market at Arc Gallery (1246 Folsom Street in San Francisco) on Saturday, December 1st from 12PM-3PM. I will have small works from my new Remnant Series as well as gold leaf and mirror paintings with many works priced under $100. New small three dimensional painting, acrylic and epoxy resin. Dimensions variable. Starting at $75 each or 2 for $100. Each artwork comes ready to hang. So Busy, 12 x 12 x 1.5”D” - Acrylic, Gold leaf, wood, mirror tile and epoxy resin on wood panel. Detail of new painting sculpture from Remnant Series. made from leftover acrylic paint scraped from my palette & saved for over ten years. I am thrilled to be included in DZINE Gallery’s latest exhibition, “X Materia” on view in San Francisco through April 2019. My “Wunderkammer” installation is comprised of miscellaneous materials collected from around the world since 2001 that have been cast in epoxy resin. The collection includes rocks, pebbles, sand, dirt, glass, brick, concrete, dried animal bone, rusted WWII chain, screws, maps, and more. The title and aesthetic of this installation is inspired from the European Cabinets of Curiosities. Also known as ‘wonder rooms’, they were small collections of extraordinary objects which, like today’s museums, attempted to categorize and tell stories about the wonders and oddities of the natural world. Each piece has its own unique history. It is a continuation of my exploration of nontraditional self portraits. In total, the collection represents 18 years, 15 countries, and 5 continents. “X Materia features works of art in various media concerned with material and place. The show explores these themes through: the direct engagement of earth-bound materials such as carbon, wax, graphite and salt; an examination of the disparate meanings attributed to location and landscape: from the awe-inspiring natural world, to those urban in-between places often overlooked; an examination of the social dynamics of those who inhabit a place and the impersonal perspectives by drones and surveillance satellites; and the very building blocks and underlying mathematical equations that govern all things. Please join me Saturday, October 20th & Sunday, October 21st from 11AM-6PM both days at Hunter's Point Shipyard (451 Galvez Avenue, San Francisco 94124) in Building 115 for our annual Open Studios. I will be showing some new large abstract paintings and also be debuting a new series of small mixed media work. A portion of sales will be donated to ArtSeed, a local nonprofit helping children in underserved communities learn through art. There will be onsite food vendors, beer & wine garden, and kids activities. The event is family and dog friendly. There is no admittance fee and plenty of free parking. Thank you all for your support and hope to see you there! Please join me on Wednesday, August 29th at DZINE Gallery in San Francisco (128 Utah Street) for an artist talk about my voicemail paintings, my recent series based on sound waves of saved voicemails, currently on view in the exhibition Cracking Nutshells. The event starts at 5:30PM and also feature talks by artists Lucky Rapp, Emilia Burchiellaro, & Ronald Chase. Huge thank you to everyone that came to Gallery 1317 in North Beach on Friday night for the opening of my solo show. The show will be up through August 30th. Please join me Friday, May 4th from 6PM-9PM for the opening of Cracking Nutshells at DZINE Gallery, located at 128 Utah Street in San Francisco. I will be showing small abstract paintings on mirrors based on an ongoing series of saved voicemails. Click here to RSVP on Facebook or scroll down to read full event description. 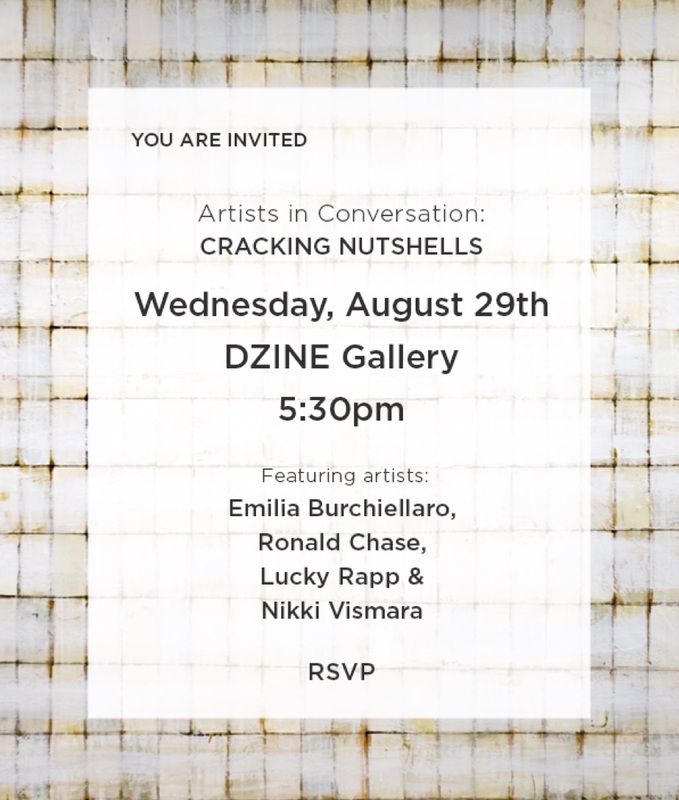 DZINE Gallery is pleased to announce the opening of Cracking Nutshells, a group exhibition exploring themes of construction and deconstruction in various media. Curated by Philip Bewley, the exhibition features work by 32 San Francisco Bay Area artists, with a number of commissioned works created exclusively for the show, including large-scale installations and more intimate works. The works of art in Cracking Nutshells are concerned with form, geometry and information systems; the subversion of worlds turned upside-down; questioning where construction and deconstruction meet; and examining the process of creating art itself. During the opening night reception, San Francisco’s award-winning Opera Parallèle will perform throughout the evening, inaugurating the company’s six-month residency at DZINE. Choreographer Amy Seiwert of the Sacramento Ballet will collaborate with Opera Parallèle to provide an accompanying dance to the musical performance. Pop-up dance performances by RAWdance will also take place throughout the gallery during the evening. Exhibiting artists in Cracking Nutshells: Emilia Burchiellaro, Ronald Chase, Diane Tate DallasKidd, Paule Dubois Dupuis, Austin Forbord, Laura Hapka, Dana Harel, Jeanne Hauser, Howard Hersh, Scott Idleman, Gina Jacupke, Nina Katz, Sasinun Kladpetch, Barbara Bryn Klare, Yoko Kubrick, Sharon Kyle Kuhn, Ellen Markoff, Adia Millett, Leslie Morgan, Sherry Parker, Lauren Parks, Jenny Phillips, Carrie Ann Plank, Silvia Poloto, Lucky Rapp, Rachelle Reichert, Georgina Reskala, Kenneth Sloan, Gioi Tran, Nikki Vismara, Victoria Welling and Quinn Wharton. If you are in Healdsburg, be sure to stop by the Healdsburg Center for The Arts. I have one painting (pictured below) in this nationally juried exhibition, Pure Abstract: Visions in Line, Form, and Color opening Saturday, April 28th 5-7pm at 130 Plaza Street in Healdsburg. Click here to preview the exhibition or purchase the catalog. "The Last Days of Methuselah" (acrylic on canvas, 60x48") is an emotional representation of the intense period of rain the Bay Area experienced in January 2017. Please join me on April 7th, 5PM-8PM for the opening of "Kat Green & Nikki Vismara: imperfect, impermanent, and incomplete" at at Barba Contemporary Art in downtown Palm Springs. Click here to RSVP for the event on Facebook. See you there! 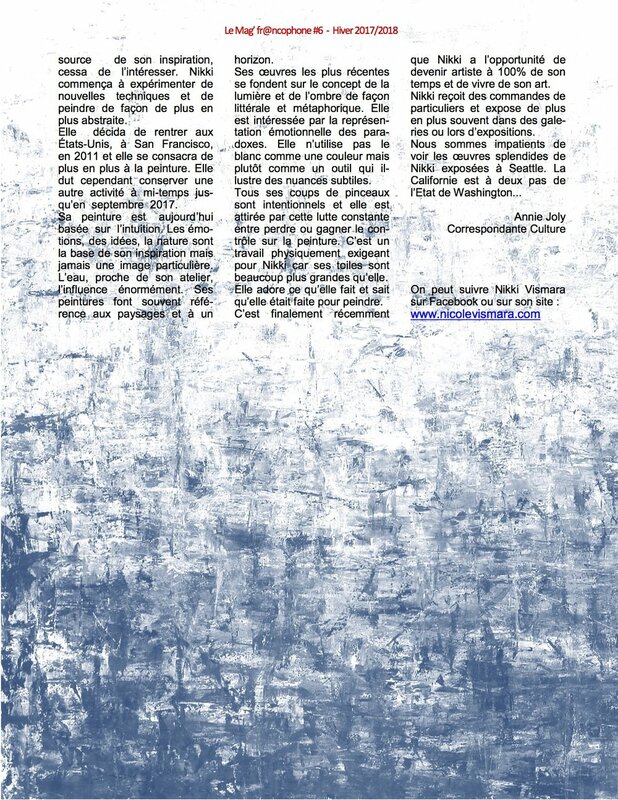 Huge thank you to Annie Joly for the write up in the French expat magazine, Le Mag' francophone, about how I went from teaching in France to making bamboo bikes in San Francisco to painting full time. Information about tickets can be found here. The stARTup Art Fair runs concurrent with Art Los Angeles Contemporary in Santa Monica. Please join me and Carol Jessen on Sunday, December 3rd from 11AM-5PM in Building 101, Studio #2113 at Hunter's Point Shipyard for the Holiday Party & Art Show. Thanks to the generosity of Artist Carol Jessen for sharing her studio with me, this is the first year I am able to participate in the holiday open studios. I will have prints and small works available for purchase. Free admission and parking. Family and dog friendly. DZINE Gallery, the San Francisco design destination, has announced the opening of its latest exhibition, Tracks and Echoes, on October 27, 2017. Curated by DZINE Gallery’s Philip Bewley, the show features work by 22 local San Francisco artists including commissioned pieces created exclusively for the event. Tracks and Echoes will be the sixth show hosted by DZINE Gallery as part of their ongoing series of gallery events in support of local artists. During the Oct. 27 opening night reception, countertenor Matheus Court and pianist Keisuke Nakagoshi from San Francisco’s award-winning Opera Parallèle will perform throughout the evening, launching the company’s six-month residency at DZINE. To complete her residency from the previous show, choreographer Amy Seiwert of the Sacramento Ballet will collaborate with Opera Parallèle to provide an accompanying dance to the musical performance. The music will be expressed in the video art of Future Fires projected onto the walls above the performers for a truly multidimensional, multimedia experience. For Tracks and Echoes, the artists explore visual, temporal, and spatial dimensions using line and repetition in works of fine art. An additional theme reflects the timing of the show from winter to spring and the moods of these seasons found in the poetry of classic Japanese haiku, where the words "tracks” and "echoes" could be “kigo” or seasonal words. In this tradition, winter is a subject of memory; of things stripped to their elements, and an expression of an exquisite, if spare, beauty. The show progresses from the quiet, yet intense beauty of winter, to more polychrome works that suggest the stirrings of spring and the eternal cycle of renewal. Exhibiting artists in Tracks and Echoes include: Paule Dubois Dupuis, Austin Forbord, Diane Foug, Laura Hapka, Howard Hersh, Gina Jacupke, Barbara Bryn Klare, Adia Millett, Lian Ng, Melissa Parhm, Lauren Parks, Carrie Ann Plank, Lucky Rapp, Rachelle Reichert, Georgina Reskala, Kenneth Sloan, Tabitha Soren, Christopher Stark, Jessie Thatcher, Nikki Vismara, Victoria Welling and Jon Wessel. The opening reception on Oct. 27 is from 6-9 PM and is free and open to the public. DZINE Gallery is located at 128 Utah Street in San Francisco. For more information, visit www.dzinegallery.com.